What models will the Lone Rider Springer Seat Kit for H-D Sportsters fit onto? Currently, our Lone RIder Seat Kit for Sportsters is designed to fit all EFI Sportsters from 2004 up to present models, such as the Iron, Nightster, 72, 48, Custom and Low. However, from 2007-2009, the ECU was placed in the rear fender under the stock seat. Removing the stock seat exposes the ECU, and if you plan on have a DarkStar Leatherworks springer seat kit on a 2007-2009 Sportster, this will need to be addressed by relocating the ECU and either patching the hole with sheet metal, or purchasing a new fender. Click here for more information. Do you offer Lone Rider Seat Kits for early model Sportsters? We do not currently offer kits for pre-2004 models, but contact us with your motorcycle details and we can take it from there. Do you offer a Lone Rider Seat Kit for other Harley Davidsons? Yes. We offer a Lone RIder Seat kit for H-D Softail Slims, compatible with 2012-2017 models. How easy is it to mount the Lone Rider Seat and Explorer/Adventurer swingarm bag kits? Each kit comes pre-assembled and with printed, full colour instructions. You will only require the usual tools such as spanners, allen keys, torque wrench and a few drops of thread lock such as Loctite 243. The kits are designed to make use of existing mounting points already on the motorcycle frame, so no actual modification to your bike is necessary. What do the Lone Rider Seat and Explorer/Adventurer swingarm bag kits? The Lone Rider Seat Kit for H-D Sportsters comes with a pair of 2” chrome plated barrel springs, a powder coated baseplate that serves as the bracket and wiring cover, plus stainless steel nuts, bolts and washers necessary to attach it all to your motorcycle. For the H-D Softail Slim KIt, there is also a vacuum formed ABS cover for the ECU included. The Explorer/Adventurer bag kits includes brackets, stainless steel nuts, bolts and washers and also marine grade P-Clips. Do you offer options on the springs? We only offer classic 2” chrome barrel springs for the springer seat kit. We have seen other companies providing all sorts of options, such as 3” and 5” springs, and even shock mounts. Firstly, these are all far too tall for Sportsters. The seat will end up pitched forward, providing a less than ideal riding position. A 2” height is perfect in terms of rider position and overall aesthetics. Can I use passenger foot-pegs with the Explorer and Adventurer swingarm bag kits? We designed our Sportster bags so that the brackets hold them away from moving parts of the motorcycle such as the rear shocks and swingarm to prevent damage to paintwork or worse. Because of this, one compromise is that standard passenger footpeg mounts are not compatible with our bags. There is a 3″ distance between the passenger foot peg mounting point and our bag. Standard sized pegs are compatible with the bag, but you may have to pivot them slightly so they point up when folded, rather than towards the back of the motorcycle. I don’t have a Harley Davidson. Can I still purchase a Darkstar Leatherworks Lone RIder seat for my motorbike? We sell the seats on their own for custom applications. You would need to have your own brackets fabricated to suit your particular bike. If you are interested, send us a message and we can let you know the dimensions of the mounting studs on our pans. What makes the DarkStar Leatherworks Lone Rider Seat Kits and swingarm bag kits better than what is available already? We bought our competitors products to see what we were up against and were not impressed. Firstly, the brackets didn’t fit properly. One didn’t clear the swingarm, and another was supposed to attach to the motorcycle via mounting points that didn’t even exist. Our brackets fit properly and safely. Secondly, our materials are superior. All our seat pans and brackets are made by a Manchester firm that has over 50 years experience making everything from air ducts to high specification components for hospital equipment. Finally, the quality of our products is miles apart, whether it is from something as simple as premium components or the attention to detail in our professionally finished leather edges. How is the Nomad pannier bag mounted? The Nomad pannier is attached using a strap system either around the motorcycle seat or with bike specific pannier rails. Some modification to certain pannier rails / saddlebag support brackets may be required depending on your particular motorcycle. What mounting hardware comes with the Nomad? The Nomad comes with two large straps to attach the bag via the seat option, two short straps to attach via the pannier rail / saddlebag support bracket option, and two cinch straps to further secure the pannier to the motorcycle. Printed instructions are included. What bikes can the Nomad fit onto? The Nomad pannier bag is designed to fit most classic type and vintage inspired motorcycles, such as Triumphs, BMWs, Ducati Scramblers and custom motorcycles. The Nomad is best suited to classic style motorcycles with rear shocks, single sided exhausts and rear frame. The pannier is a universal bag but some modification of you motorcycle may be necessary. Make sure before first use that the product can be fixed properly and used without problems with your vehicle type. The leather we use has undergone a tanning process using natural, organic materials and has been around for hundreds of years. We only use cow leather as it is a byproduct of the food industry, and for ethical reasons, we refuse to use any exotic leathers. Any tips for caring for my leather? Vegetable tanned leather will develop a fantastic patina and character over time that will be unique to you. Some care is involved however, and will depend upon your usage. General cleaning can be done by wiping the leather surface with a damp cloth. Leather that is exposed to the elements more often, such as the motorcycle seats and saddlebags will need to be conditioned with any general leather balm that contains some combination of beeswax and lanolin/jojoba oil. This will help keep your leather water resistant, supple and free of cracks. Do you actually make your products? All our leather goods are made in-house at our workshop just outside of Manchester, England. 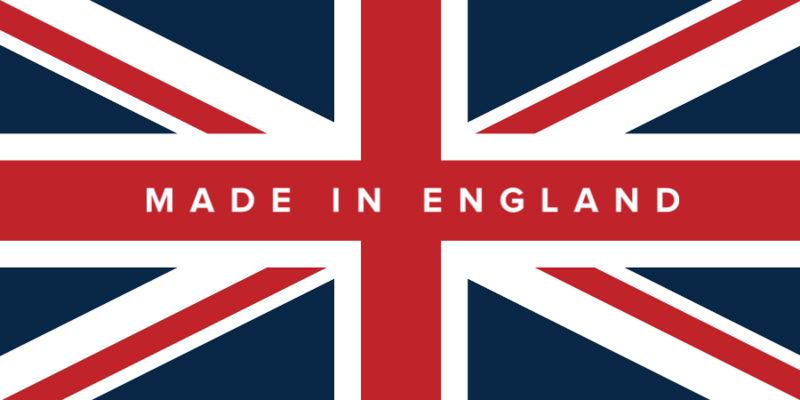 We do not outsource production, stick our name on it and sell it on, nor do we merely carry out the final stages of assembly and claim “Made in England”.